Welcome to Day #4 of Chocolate and Strawberry Theme Week. Nathan Miller is one of the few chocolate makers brave enough to incorporate buttermilk* into some of his craft chocolate bars. Buttermilk adds a tart sweet and salty freshness to milkshakes and desserts, so why not chocolate bars? 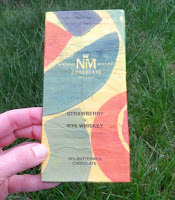 Today's Strawberry and Rye Whiskey bar from Nathan Miller (Chambersburg, PA)—wrapped in festive yellow, green and orange (what looked to be handmade) paper and sky blue foil—had an intriguing dark chocolate aroma with fresh strawberry aroma. The 55% dark chocolate had a relatively smooth, almost creamy melt and texture, and a slightly complicated flavor profile. It had a somewhat unexpected earthy (dirt, mushrooms) flavor spike about a 1/3 of the way through the tasting experience. However, on the back side of this note, there was a very faint hint of what was likely whiskey, followed be a pleasant slight strawberry and buttermilk ice cream finish. 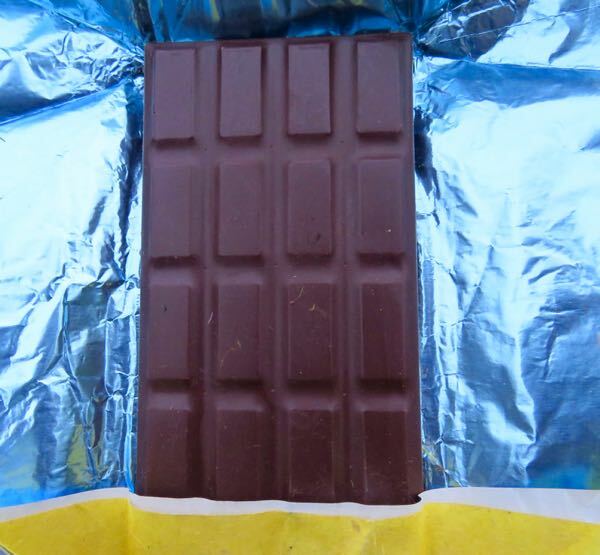 Ingredients: 55% buttermilk chocolate made with Oko-Caribe direct trade organic Hispaniola cacao, organic buttermilk, raw fair trade organic cane sugar, organic strawberry, organic cacao butter, organic rye whiskey. *The company also sells a bar made with camel milk.